If you’re whether we’re near the end of this campaign, then our first chart should deal with any residual doubts. The past week has seen an explosion of activity by all groups, far in excess of any other point since our monitoring began in late January. 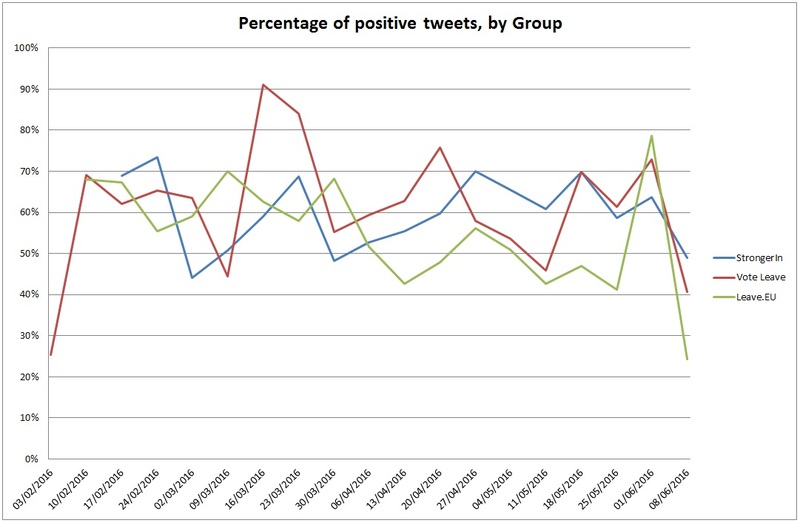 Not only did the two official groups produce over 2000 tweets between them, the other eight groups produced another 2000: all of this after what had been an elevated load last week. The reasons for this are not hard to divine. Firstly, there is a general sense in the air that this is the last opportunity to sell messages and convince voters. 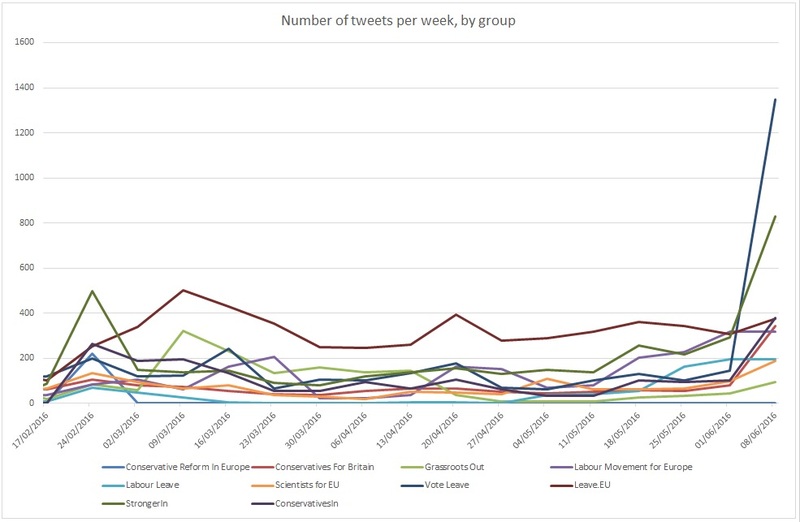 Secondly, the arrival of the televised debates was a huge driver of content: Vote Leave corralled several hundred tweets around Michael Gove’s appearance on Sky, StrongerIn and ConservativesIn did the same for David Cameron on ITV, while other groups chipped in (often not positively, as we will see). This is a situation where Twitter works very well, allowing for near-instantaneous comment and reaction, important when opinions and media coverage are being formed very quickly. With three more events to come (including last night’s, which isn’t included in this sample), we can expect much more of the same. This large upsurge of content production has been mirrored – albeit only partially – by a growth in uptake. 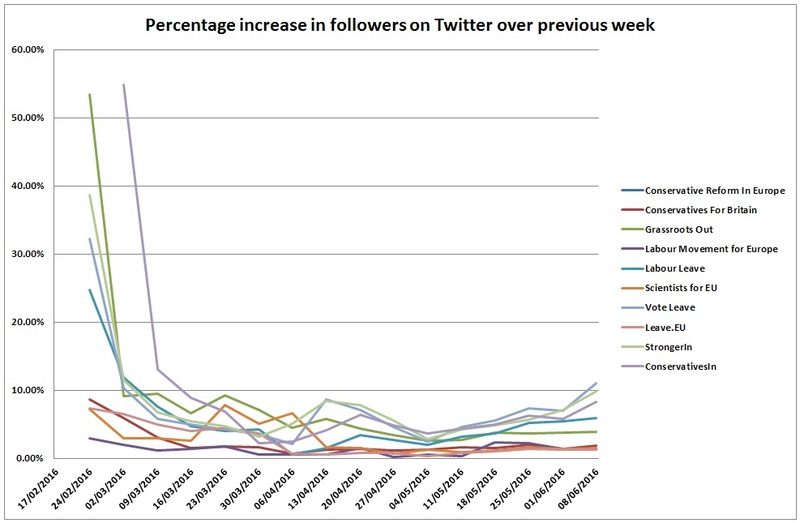 Groups have seen strengthening growth in their followers, although this is still far below the rates seen in February. 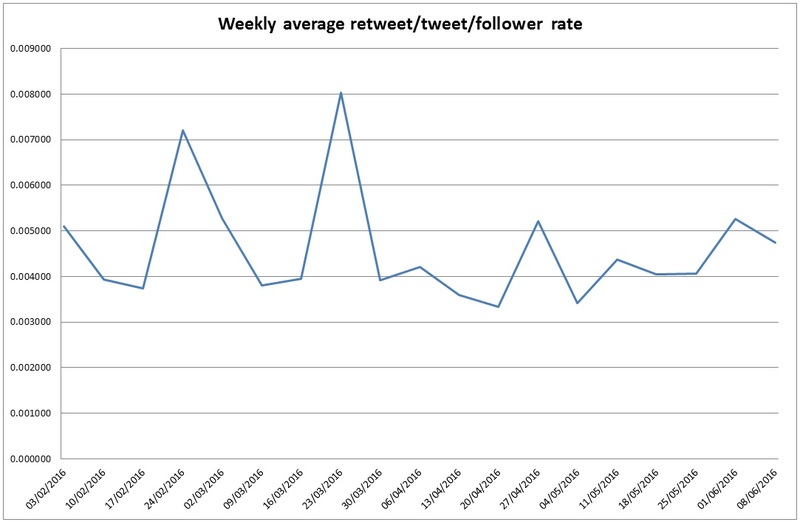 Interestingly, when we look at average rates for all groups’ standardised retweeting (our marker for engagement), we find that this has not moved off its long-term trend, and indeed dropped from last week. 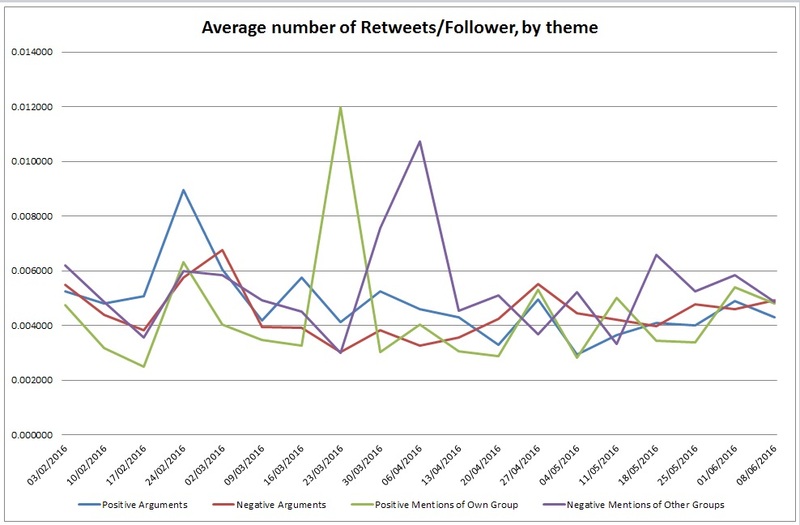 This is partly a mechanical effect, caused by the shear volume of tweets (which would have limited opportunities for people to see and retweet them), and the overall volume has moved up considerably. All of this activity has come with a certain price. 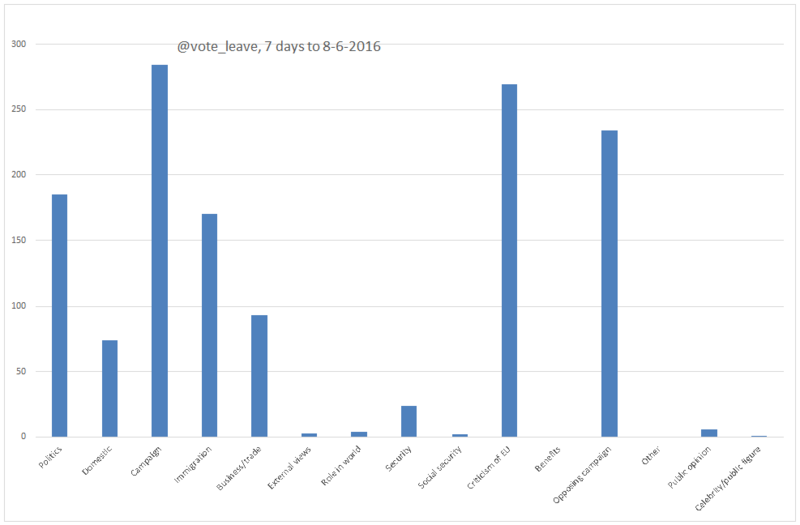 Rates for positive framing by all three main groups – Leave.EU, Stronger In and Vote Leave – have dropped substantially in the past week, with all three now below 50%. Again, this has been driven by the TV debates, where a lot of effort was put into attacking the other side: it’s easier to criticise at speed than to produce positive frames (although Vote Leave appear to have found large numbers of complementary comments about Gove from other Tweeps). 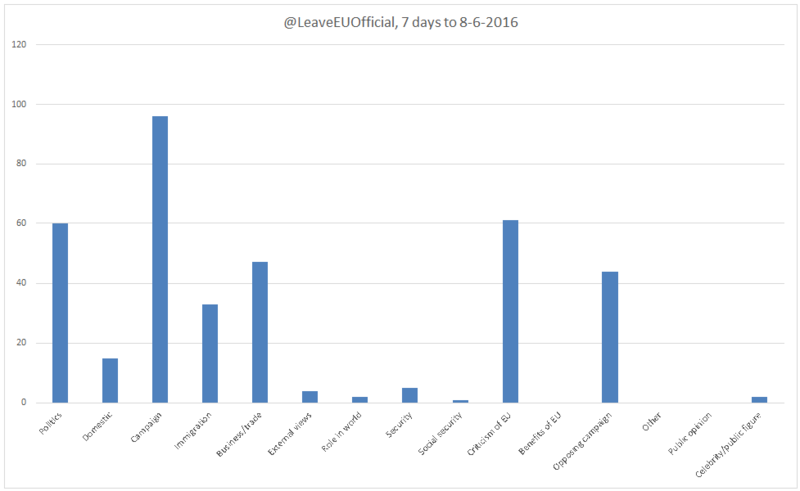 After David Cameron’s efforts to avoid calling Leave Tories ‘liers’, we also note that Vote Leave didn’t return the favour, using the word many times during his debate. 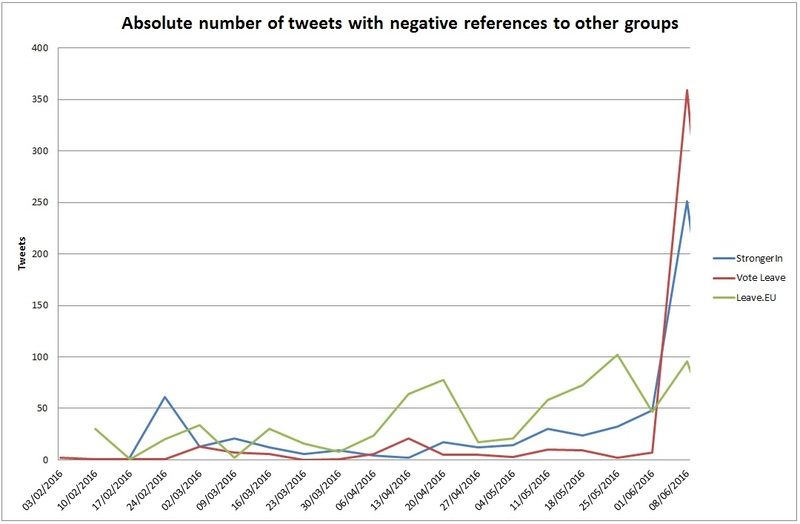 In both absolute and relative terms, the size of the negative comments far outstrips what has been previously seen. 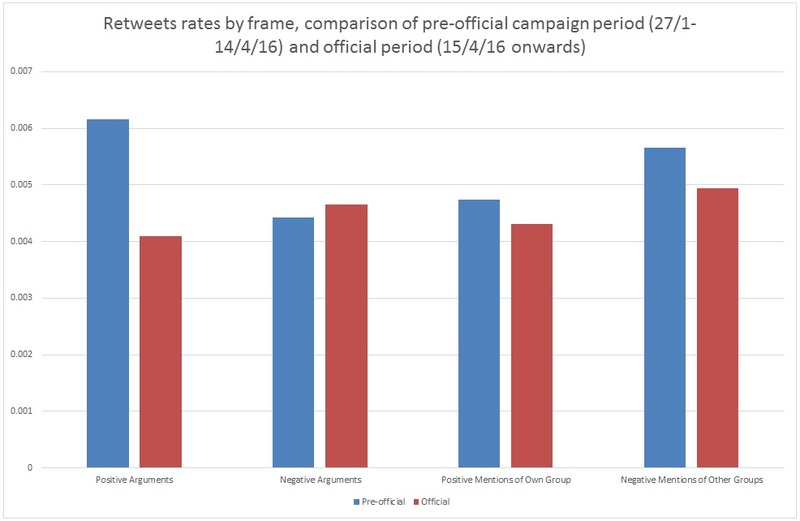 Of course, production doesn’t mean consumption and our tracking of frames bears out that negative frames haven’t established an unambiguous advantage over positive ones: it has only been during this week that any frame used in the official campaign period has been more engaging than in the period before 15 April. What are they campaigns talking about? The two official groups primarily focused on their core message this, promoting their own campaign and criticising the opposing campaign. So for StrongerIn this meant a focus on arguments related to 1) business, trade and the economy, then 2) criticising the other campaign and then 3) promoting their own campaign. Vote Leave concentrated primarily on their 1) own campaign (in particular, praising Gove’s performance in the debate), 2) criticism of the EU and 3) the opposing campaign. 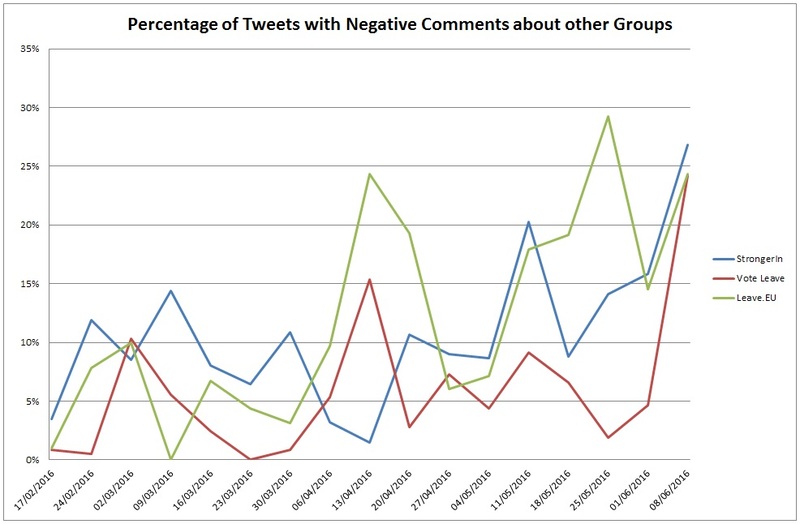 In contrast to the two official campaigns, LeaveEU (which as discussed above produced significantly fewer tweets) focused on 1) campaign related tweets, 2) criticism of the EU and 3) politics. 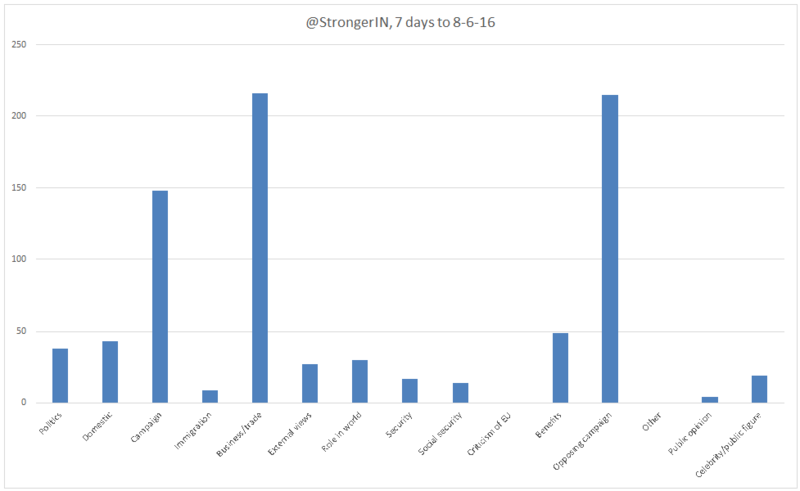 In next week’s post, the last before the referendum, we’ll be pulling together our various analyses and giving some overview of the social media campaign.